1988 Cadillac Sedan Deville Temp Light comes on when AC on. When I switch off it turns off the Tem Light. No delay immediately. Any thoughts? It appears this car has 2 different temp lights. One of them is "Coolant temp/Fan indicator" and the other one is "Stop engine Temp Indicator". I don't know how it works for sure but it appears one light is supposed to come on when the cooling fans are operated which would be any time the AC is on. On the climate control panel hold the off and warmer button at the same time with the ignition on. It will display current or history trouble codes stored in the ECM and the BCM. Trouble codes starting with "E" are ECM code and "F" is BCM codes. It's a FWD car with a transverse engine. It has to be electric. Pressed "Off and Warmer" and got E38 E52, E55 F41 F55 nothing I could relate back to the AC. E52 is Long term memory has been reset. That happens if the battery is disconnected. Some 1988 DeVilles and Fleetwoods may turn the Coolant Temp/Fan telltale on intermittently and set BCM code F41. Code F41 was eliminated on 1988 DeVilles and Fleetwoods with the elimination of the cooling fan module. 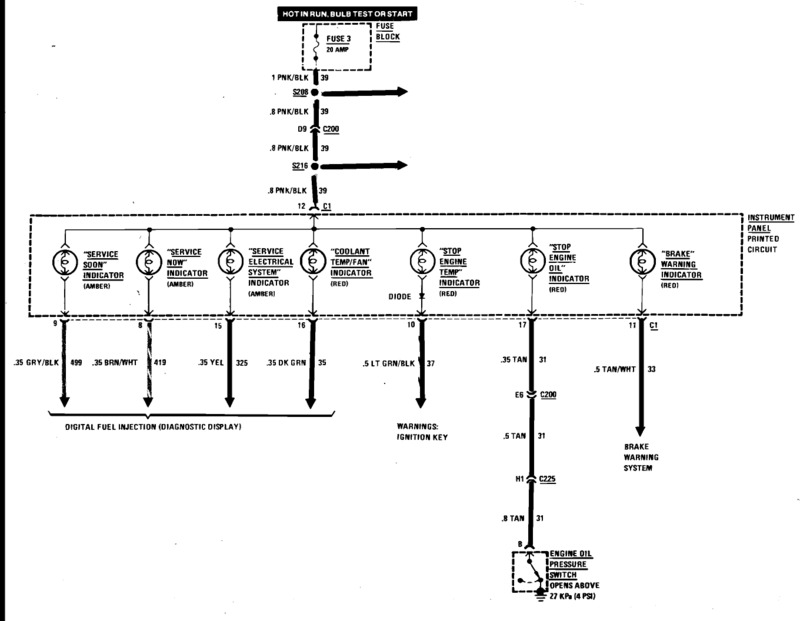 However, if the incorrect BCM PROM is installed in these vehicles, code F41 may set as a result. To check for an incorrect BCM PROM, check BCM parameter P.3.1 BCM PROM I.D. The correct BCM PROM I.D. for 1988 DeVilles and Fleetwoods is 22 or 23. If the BCM PROM I.D. is less than 22 (i.e., 20 or 21), replace the BCM PROM with the proper one as listed in the parts catalog, Section 3.670. For warranty purposes use Labor Operation N4801 at .4 hour for BCM PROM replacement. Wondering if the BCM is actually at fault or the low pressure switch on the ac acting out (sending bad reading)? This only flips the Tem Light on almost as fast as I turn the AC on or turn it off. Happens really quick both ways. According to the TSB that code shouldn't exist in the BCM. Maybe at one time the BCM was replaced with an older version? Has it always done this? Do the cooling fans operate when you have the ac turned on? Does the ac blow cold? My mistake. Its a 1987 by the VIN. Today when I started her up the AC powered on and cycled cold. A minute later the Temp light upper right hand on the Dash came on. The radiator is not running hot at all after 30 minutes and again if I flip-off the AC the Temp light turns out. The AC however did stop blowing cold. That being said I thought Id replace the ac pressure sender on the low side. Both the electric radiator fans operate. They are original equipment. I thought about maybe replacing them after all they are 30 years old. 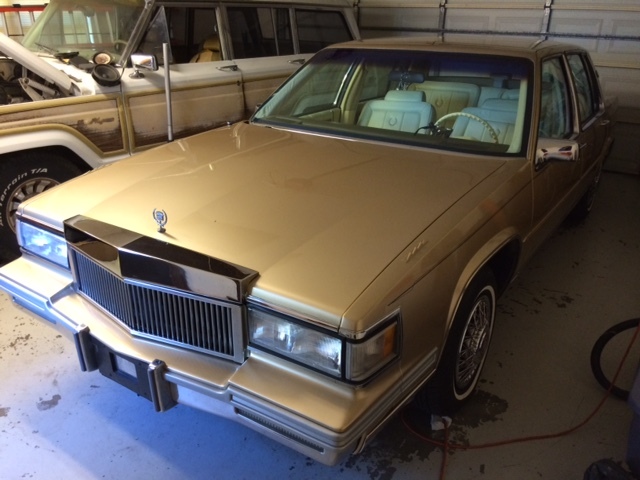 This Caddy has 49,000 miles on it. The 87 still has 2 different red temp lights and I still think one of them comes on to indicate the external fan has come on. The light that comes on is on the right side and is the "Coolant Temp/Fan Indicator". Im just perplexed that I saw the Temp Fan red light come on and it blew cool for about 3 minutes then shut down. Howver if I turn the Ac off the Temp Light immediately turns off (2 seconds). That tells me the AC operation or the Fan is driving this light. That tells me the AC operation or the Fan is driving this light. Isn't that what I just tried to tell you? If this is an 1987 Deville, then F41 code means there is a problem with the cooling fan circuit. - 6-10V if the fans have been turned off. - 0V if the fans have been turned on. - 0V if both fan connectors are open. A. The BCM has commanded the fans off but the feedback voltage remains low. The BCM will keep Code F41 hard for the rest of the ignition cycle and continue providing a normal control signal to the cooling fans control module. The BCM will again test this condition if the malfunction has become intermittent. B. The BCM has commanded the fans on but the feedback voltage remains high. The BCM will command the fans off to protect the system from a possible stalled or shorted motor condition. If the control temperatures (coolant and A/C high side) should drop below the turn off points and later require the fans on, the BCM will repeat the test to determine if the malfunction has become intermittent. Both of the above will reslut in the "Coolant Temp/Fan" telltale being illuminated whenever the control temperatures require cooling fans operation. 1. The cooling fans override feature (F.8.5) can be used to evaluate the system operation. If either fan is off when "high fans" are commanded or if either fan is on when "fans off" is commanded, the appropriate diagnostic path can be followed to isolate the malfunction. 2. The cooling fans status indicator can be used to evaluate the feedback signal being received by the BCM. If the "auto fan" indicator does not agree with the actual fans operation, circuit 791 must be investigated for a possible malfunction. If the status indicator does agree with the command fans operation within the appropriate time period, then the cause of Code F41 is not currently present. Notes on Intermittents: If an intermittent Code F41 is being set, manipulate the related wiring while observing the cooling fans status indicator (auto fan) and commanding "High Fans" or "Fans Off" in the F.8.5 diagnostic mode. If the failure is induced, the fans status will not agree with the command operation. This will help in isolating the location of the malfunction.